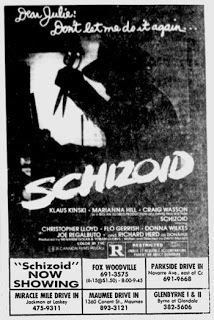 Released in 1980 the trailer and even the poster for Schizoid make it seem like a slasher film and while there are slasher aspects to the film it isn’t a slasher film so if that’s what you’re expecting you might be letdown. With the success of John Carpenter’s Halloween in 1978 by the time 1980 rolled around slashers were quite profitable and it seems writer/director David Paulsen wanted to cash in on that without making a full out slasher film. If anything Schizoid can be labeled as an American giallo and had this film been made in Italy it would totally be a giallo. We have a few victims, a few suspects and a killer wearing black gloves. Even though this film can be called an American Giallo it does lack the style of such films by the likes of Dario Argento and Mario Bava. Schizoid was long OOP until Shout Factory released in Blu-ray/DVD combo pack along with X-Ray (Hospital Massacre) in a double feature. Schizoid has a solid cast and that in part helped keep the film from being completely forgotten, but Schizoid isn’t very well known and its not too difficult to see why, but with that said its not a bad movie or anything, but its just sort of lackluster. Schizoid is a very frustrating film since it has the right idea, but yet never works as well as it could have. A lot of the reviews for Schizoid are either negative or seen as average at best and I can easily see both points. I really wanted to like this film since again it has the right idea and while I still got some enjoyment from the film I walked away feeling this could have been a truly great thriller rather than an average at best thriller. A lot of what helps keep the film at least semi interesting is the cast and its too bad we couldn’t get better results, but I suppose it also could have been a lot worse. Julie (Hill) an advice columnist for a newspaper begins getting strange notes with the threat if murder. Most write the notes off as a prank, but soon members of Julie’s therapy group are turning up dead. The screenplay by David Paulsen isn’t very well plotted as its as simple as the plot description. The letters and deaths just sort of happen with really no info given really until the killer is revealed and the motive is a bit silly. Character wise there isn’t a whole lot more happening as they lack any real depth. The mystery side of the screenplay is ok, but it shouldn’t really come as a major surprise to their identity. The script though isn’t bad, but its never as good as it really could have been. Besides writing, David Paulsen also directs and he’s also written and directed for such shows as Knots Landing, Dallas and Dynasty. Paulson made his directorial debut with Savage Weekend and Schizoid was his 2nd feature film. 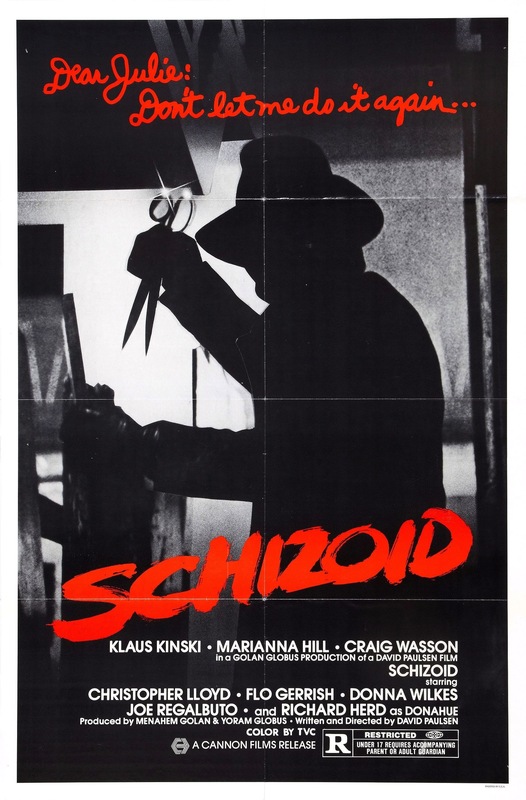 Here with Schizoid, Paulsen crafts a fairly entertaining film, but it does often have some sluggish pacing despite running at only about 89-minutes. The film gets off to a fairly good start, but its unable to keep that momentum going. There are some decent moments of suspense and while its nothing we haven’t seen before it still works decently. While never a great film it’s entertaining enough, but towards the last 30-minutes is when things start to unravel as it seems overly long and just not very interesting. Overall David Paulsen delivers an average film that had the potential to be a lot more and while not poorly made it just lacks the excitement needed. Overall Schizoid is never as good as it really could have been, but despite the way my review sounds I didn’t dislike the film. For the most part Schizoid is an average film, but its the final 30-minutes is when things start to really drag and for a film that already had pacing issues it sinks the film. While I can’t fully recommend Schizoid it is in the very least worth a watch at least once.